Dirty carpets and rugs make your otherwise clean house look filthy and untidy. Vacuuming your carpets and rugs regularly may not be enough to stop your carpets from growing paler with time. At Superior Cleaning and Restoration Inc. Murrieta we can help you with this problem. Whether it is the entire carpet or just the rug area, we solve problems of every size. Our skilled and trained team uses a truck-mount hot water extraction unit along with 100% eco-friendly cleaning products. These products are recommended by leading carpet manufacturers. We provide multiple methods and applications to remove all kinds of issues like pet stains, odor, mold and mildew. 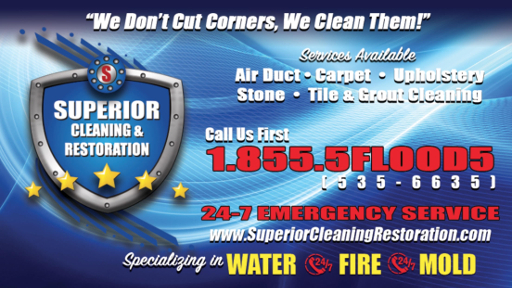 We are the only company in Southern California with a truck mounted duct cleaning system. This is the #1 recommended system by HVAC duct manufacturers. It not only cleans better than any other system it’s also safer for the ducts and won't tear the lining which decreases air flow and efficiency. To protect your carpet from any further staining from grease, oil, blood, food, pet stains and spills, we provide Teflon Carpet Protector. We are able to resolve all types of carpet and rug damage that can occur. We employ experienced and hard-working employees that leave no stone unturned in providing our customers the best services possible.